All of Japan, especially the capital city, is working hard to prepare for the 2020 Olympic Games. Many new facilities are being built, more signs are appearing in different languages, and more tourist-friendly facilities are popping up. One such facility, Travel Hub Mix, is here to help tourists make their trip smoother and more memorable. Travel Hub Mix started in summer 2017 to provide services to tourists. But they are not merely a tourist information site. The "MIX" idea is Meetup + Inspiration + eXperience, which means providing a meetup space for travelers, or those who have a passion in tourism, to inspire each other as well as offering different travel-related activities for everyone to experience Japan. • Exhibiting a VR travel experience, letting users feel what it's like to travel to different areas in Japan or participate in different cultural activities (tea ceremonies and dance for example). 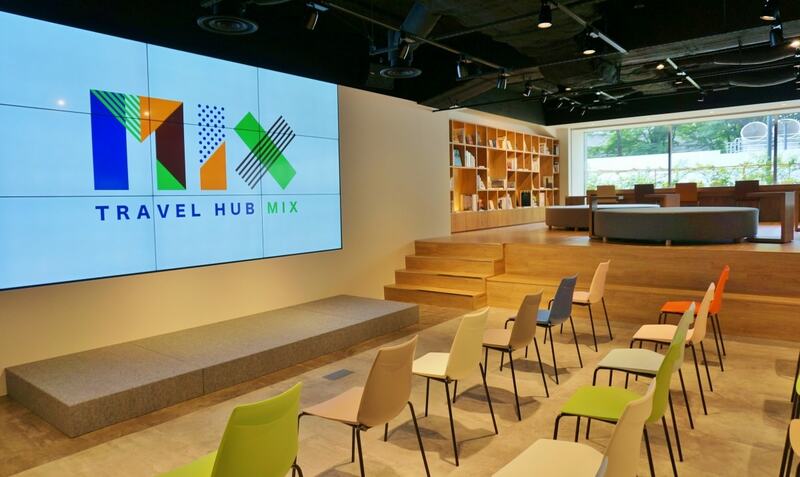 One of the main goals of Travel Hub Mix is exemplifying "experience," which aims to let visitors learn more about Japan firsthand. For that, Travel Hub Mix has a space for seminars and a kitchen for Japanese cuisine demonstrations and tastings. Since Travel Hub Mix opened, there have been many seminars on Japanese tourism, cultural experience and future trends of Japanese travel. I was so very honored to give a speech on the stage as "Captain Shiozaki" to promote to the public, on behalf of the Japanese government, how beautiful Japan is through my journeys.